Content: As you can tell from the first sentence, the big content issue with this book is LANGUAGE. If you have problems with that, then this book isn’t for you. It’s in the science fiction section of the bookstore. 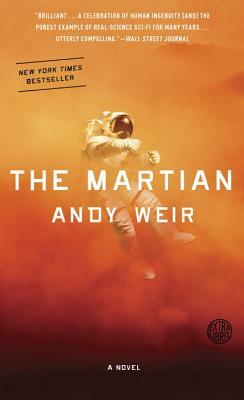 Mark Watney was one of six astronauts sent to Mars as part of an exploratory and scientific mission. He’s a botanist and was trained to be the fix-it guy, and he was expecting to spend 31 days on the planet with his crewmates and then head home. Then, six days in, a storm kicked up, and an accident happened and he was considered dead. So, the captain made the decision to leave him. Turns out, though, that he wasn’t dead. Thus starts 368 pages of the best problem solving novel I’ve ever read. Seriously. Weir throws all sorts of things — most of them being normal, every day sorts of things; there’s not many super extreme situations here — at Watney and has him figure out how to survive. You wouldn’t think it would make for a fascinating, gripping novel but it does. Part of this is because Watney is a hilarious (if foul) narrator. He’s SO snarky, and laugh-out-loud hilarious, which helps diffuse the tension in the novel. It also makes it a very practical book, which makes me wonder how much of it is actually accurate science. (I gather, from the author notes at the end, quite a lot.) I kept turning the pages (and staying up late) wondering just what the heck was going to happen next. I don’t usually go in for books that have a lot of hype or even a movie coming out, but this one is definitely worth all the buzz surrounding it.